Baltimore-based composer and songwriter Elliott Grabill recently received an honorable mention in the Arcady 2019 Emerging Artist Competition for his Two Songs of Incarceration, part of a larger song cycle addressing social justice. He has also received recognition for his electronic and chamber music. 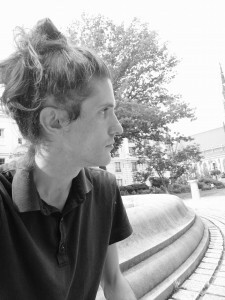 He was the 3rd place winner in the Peabody Prix d’Eté for his meditative electronic work Gravity for solo clarinet, and recipient of the Dark in the Song Prize for his bassoon quartet Escape. For over a decade he has written music for ensembles such as Pique Collective, Dark in the Song, the Washington Men’s Camerata, the Meridian Arts Ensemble, and Quartetto Apeiron, as well as collaborating with artists of other media like Danielle Madrid, Vin Grabill, and the Black Cherry Puppet Theatre. Soloists such as Peter Sheppard-Skaerved, Hila Zamir, Melissa Lander, Shawn Earle, Andrew Im, Tae Ho Hwang, Michele Jacot, and Andrea Cheeseman have also taken on his work. In the mid-Atlantic region his work has been performed or screened at the Rosebud Film Festival, the Kennedy Center for the Performing Arts, the Windup Space, Reverb, the Black Cherry Puppet Theatre, the Peabody Thursday Noon Concert Series, the UVA Technosonics Festival, the Temple University Conwell Dance Theatre, and American University. His work has also been featured at Electroacoustic Barndance, the Athens International Film and Video Festival, inner sOUndscapes, the International Computer Music Conference, the SEAMUS Conference, the New York City Electronic Music Festival, June in Buffalo, highSCORE, the National Student Electronic Music Event, and the Toronto International Electroacoustic Symposium. Mr. Grabill teaches math in Baltimore City. Teachers include G. Bradley Bodine, Steven Coxe, Matthew Burtner, Kirk Nurock, Judah Adashi, McGregor Boyle, Geoff Wright, Amy Beth Kirsten, Jason Eckardt, and Michael Hersch.